I often find myself reading a book where the main character goes out for a run. I love characters that run, and I'm going to start a special category on this blog for books in which running is mentioned! If you know any books, please let me know, or email me! the quotation/text that's about running! 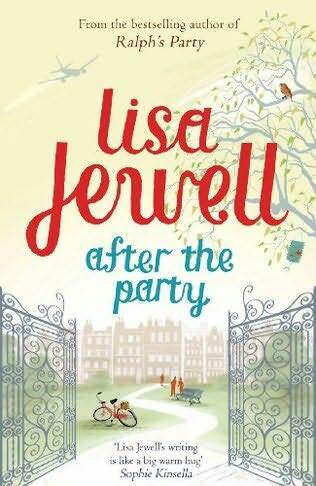 Let's kick this category off with Lisa Jewell's novel 'After the party'! 'It was a warm morning. Jem was taking Scarlett to nursery. Ralph was going for a run. Running was an activity that Ralph had always viewed with some suspicion. There were three women who ran past Ralph and Jem's bedroom window every single morning at 6.45 a.m. exactly. In the winter months this would occur in pitchblackness and be utterly unthinkable to Ralph. Why, he wondered, would anyone peel themselves from a warm bed, pull on a pair of leggings en pound the streets in the ark? Even during more civilised hours it struck Ralph as a slightly unnatural thing to do. If an alien were to land in Herne Hill, sit himself at a pavement table outside a café and look around himself at humanity, after a while he might think he had worked out what was going on, and the someone in neoprene would run past, pat-pat-pat, ears plugged with white wires, eyes staring blankly adhead and throw the alien completely off course. But then Spring had happened and the idea of cloisering himself away in the windowless, strip-lit obscurity of the gym has lost its appeal and Ralph had put his prejudices to the back of his mind, his trainers to the pavement, and become a born-again runner. He loved the feel of his feet against the pavement and the music in his ears. He loved the searing coldness of the air being dragged into his lungs and shot out again. And he especially loved the sense of begin both part of humanity and yet removed from it by sped, by mission. I'll be looking forward to seeing your other selections. Good choice! Found you at the Monday Blog Hop and am glad I did! Am a happy new follower! incidentally, the captcha word verification i got for this comment is "faterado" which is... also inspiration to run. in its own way. ;) haha.